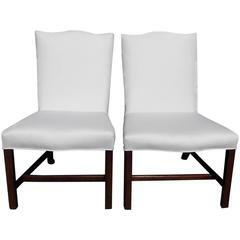 Pair of American Federal mahogany side chairs with carved splat backs, removable upholstered white muslin seats, and terminating on the original saber legs. Early 19th century. Pair of English mahogany serpentine back lolling chairs with squared tampered splayed legs and connecting stretchers. Chairs are upholstered in white muslin, Late 18th Century. Pair of American Federal faux bamboo painted side chairs with spindle back and rush seat with cushion. 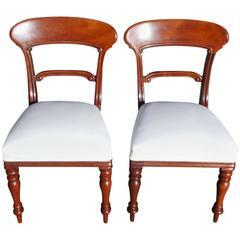 Two mahogany chairs with saber legs and Classic klismos shape. Upholstered in a gold and cream damask. England, mid-20th century. Early 20th century Art Nouveau elegant robust couple of side chairs in blond walnut, new upholstered, restored and polished to wax. Measures cm: H 45/100, W 40, D 43. 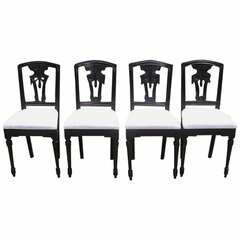 Set of four American country federal style (19th century) tiger maple side chairs with a stretcher and rush seat.